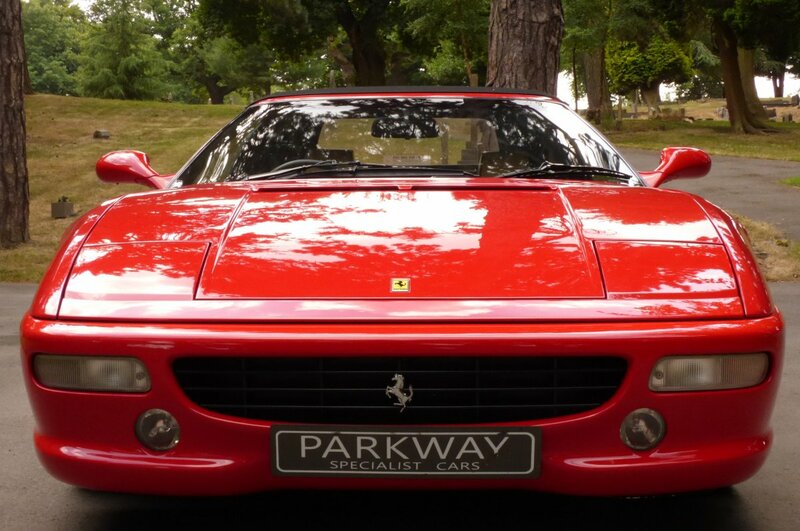 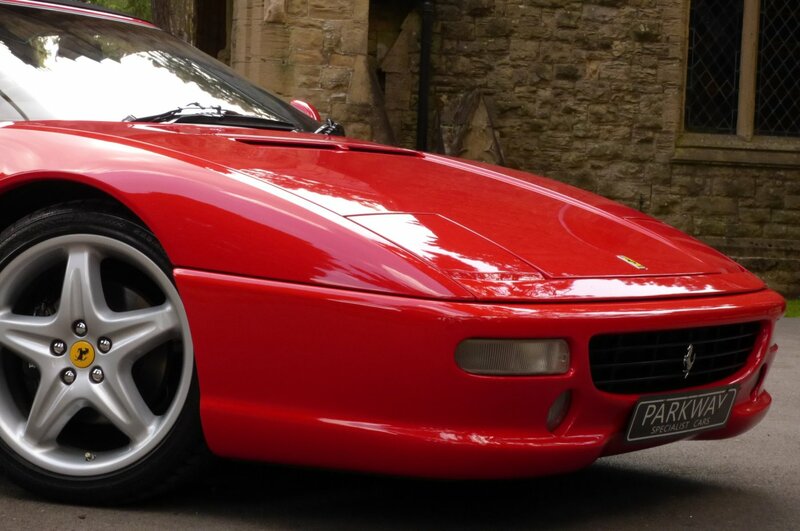 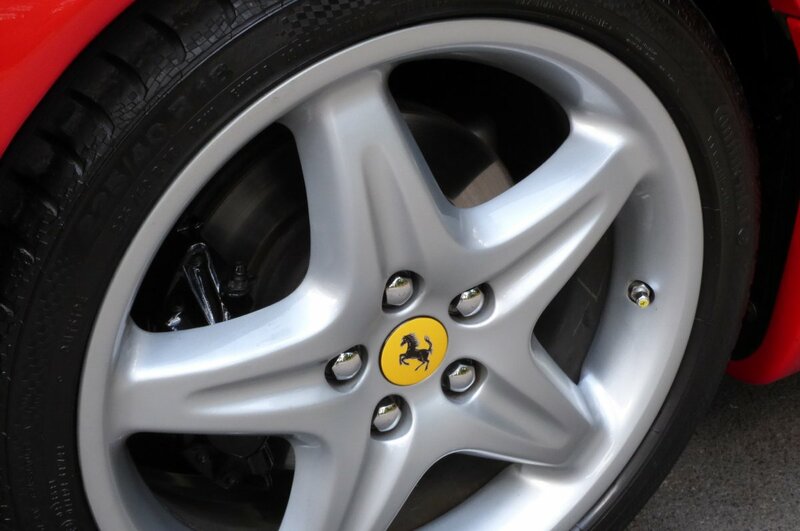 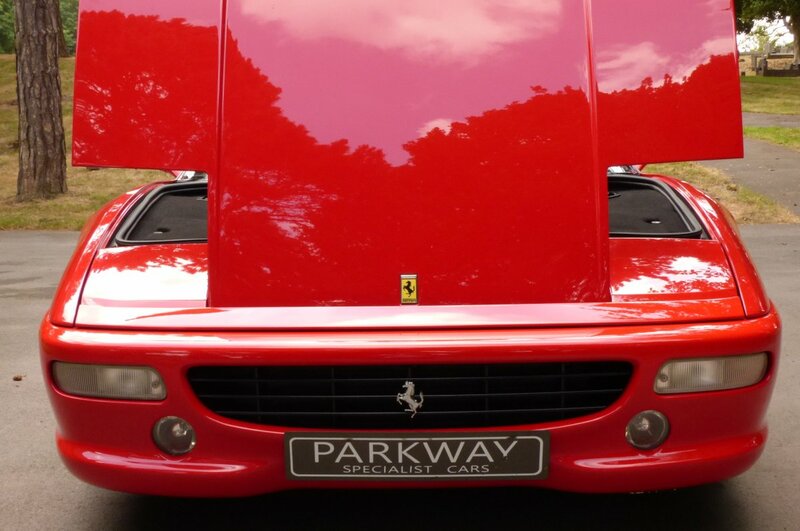 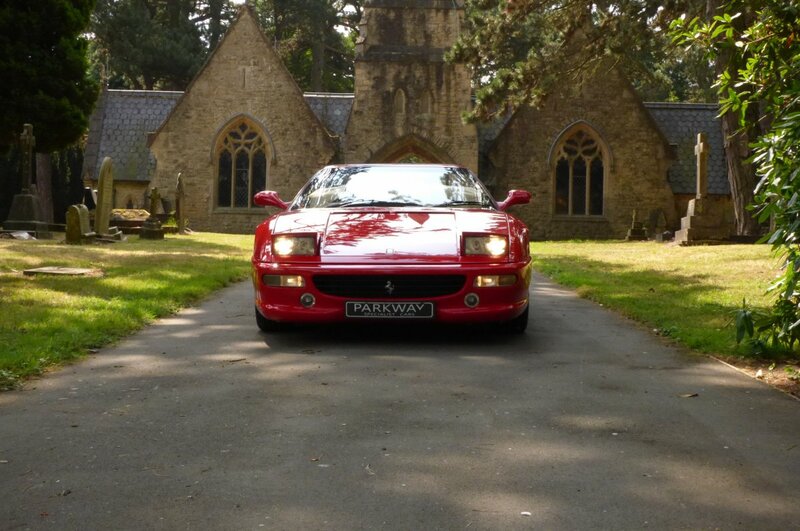 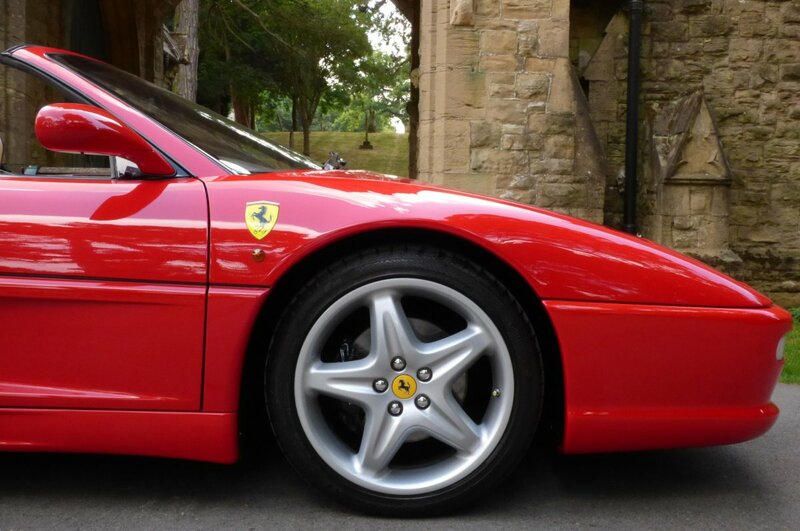 The Ferrari 355 Evolved From The Then Dated Ferrari 348 Model, With Many Purist Of Ferrari Buyers Seeing This New Model As A Huge Step Forward For The Italian Car Making, Heralding The Return Of The Beautiful Ferrari After The Brash Brutality Of The 1980`s Machines. 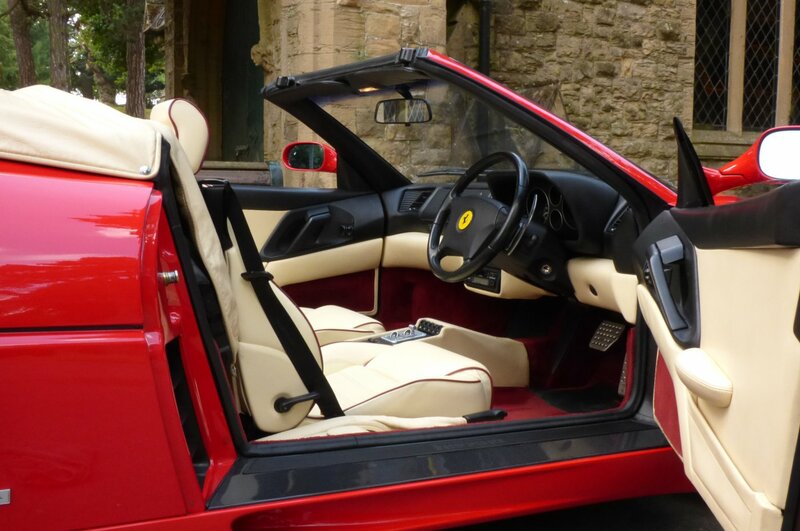 The Maranello Factory First Showcased The 355 Design In 1994 At The Geneva Motor Show, With Two Out Of The Three Models Planned, With These Being The Fabulous Berlinetta Coupe And The Targa Versioned GTS, However Those Seeking A True Open Top Convertible Needed To Wait A Further Twelve Months Before The Sensational Spider Became Available In 1995. 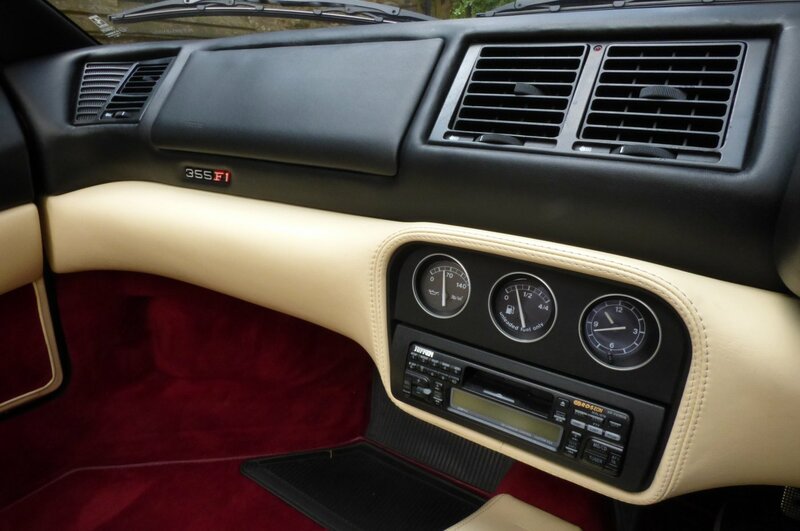 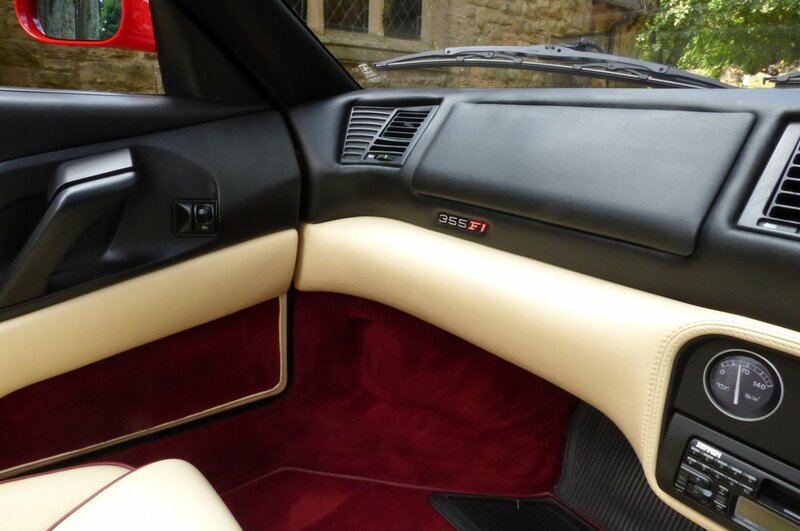 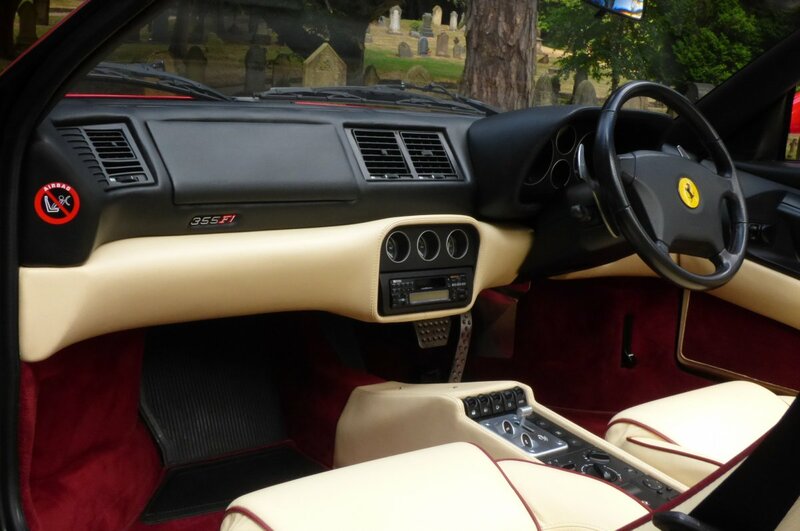 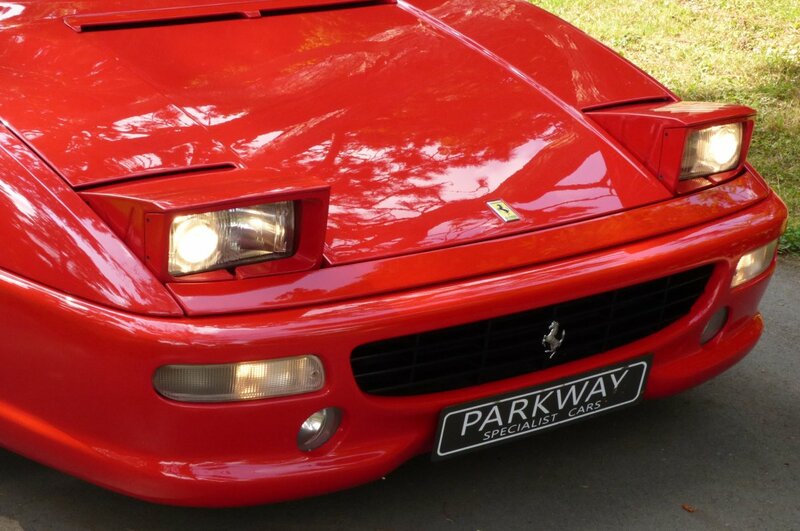 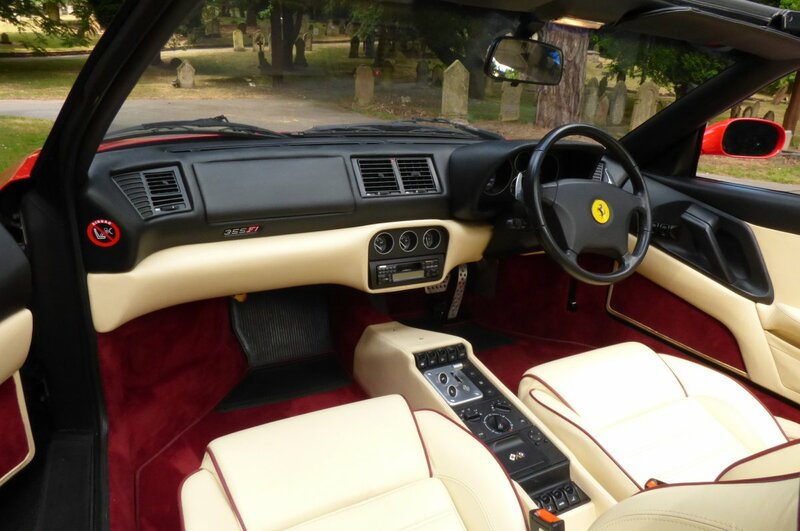 The First Buyers Had One Transmission Option Being The Six Speed Manual Box, However In 1997 The Factory Also Include The Automatic F1 Style As An Option And On UK Numbers Produced, These Are Some Of The Rarest To Now Find, As A Total Of 434 Vehicles Had Been Assigned To Ferrari Main Agents, With Just A Small Number Of 139 Being F1 Specified. 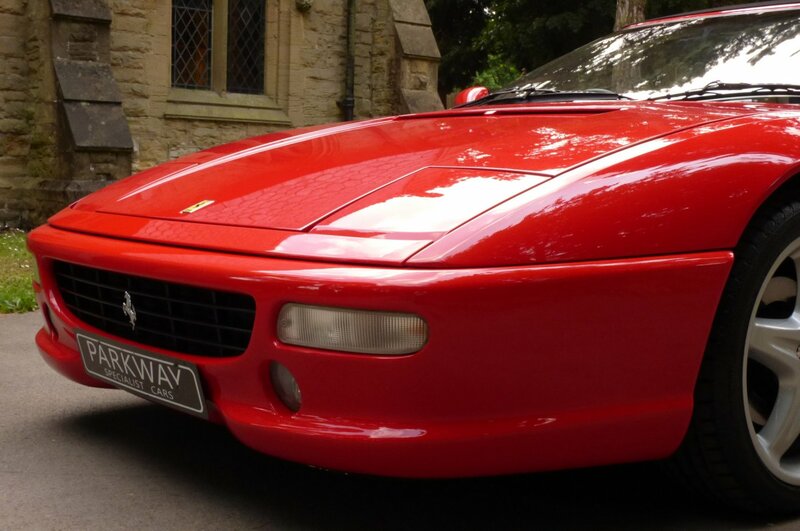 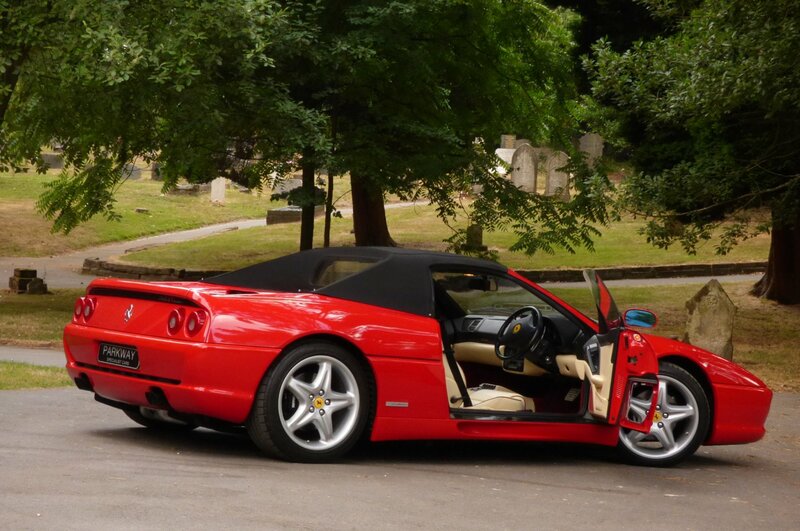 The Ferrari 355 Is Still Viewed As Being One Of The Most Distinctive Designs Ever Created, With The Beautiful Sculptured Body Being The Ultimate Test For The Designers From Pininfarina, As They Wanted To Design An Elegantly Bodied Masterpiece, Which Still Would Generate The Very Best Performance Statistics, With Both Of These Main Stipulations Taking Well Over 1300 Man Hours In The Factory Wind Tunnel To Complete The Analysis Correctly. 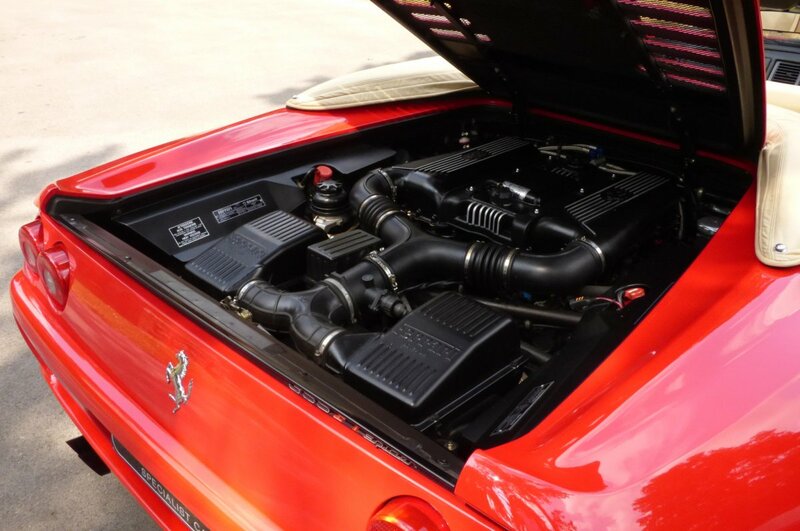 The Ferrari Engine For The 355 Was Also Improved From The 348 Predecessor, Now Fitted With A Three Point Five Litre V8, Five Valve Cylinder Head, This Produced A More Than Healthy 375 Brake Horse Power, Which Would Accelerate Both Driver And Passenger From 0/62 MPH In Just 4.9 Seconds, Would Then Further Climb To An Electrically Limited Top Speed Of 183 MPH And Was All Available, With Or Without The Electric Canvas Roof In Place. 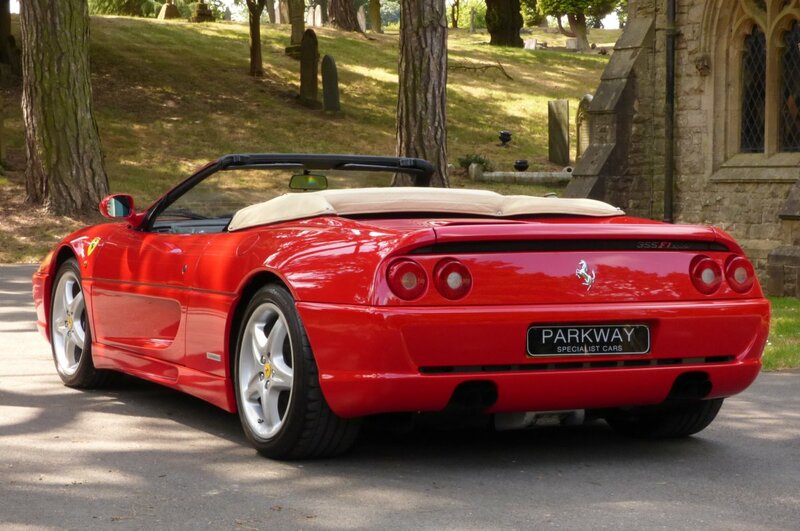 Chassis Number 113964 Was Firstly Supplied By Maranello Ferrari Surrey In The November Of 1998 And Since This Date Of First Registration, Being Just Under Twenty Years, Our Offering Has Only Had A Mere 35551 Miles Applied From New, To Which If We Break This Down Further Is Approximately Just 1800 Miles Per Annum. 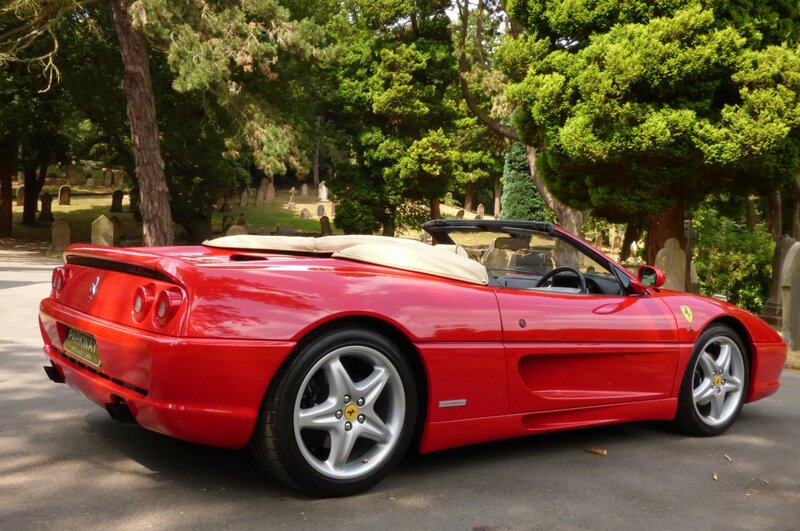 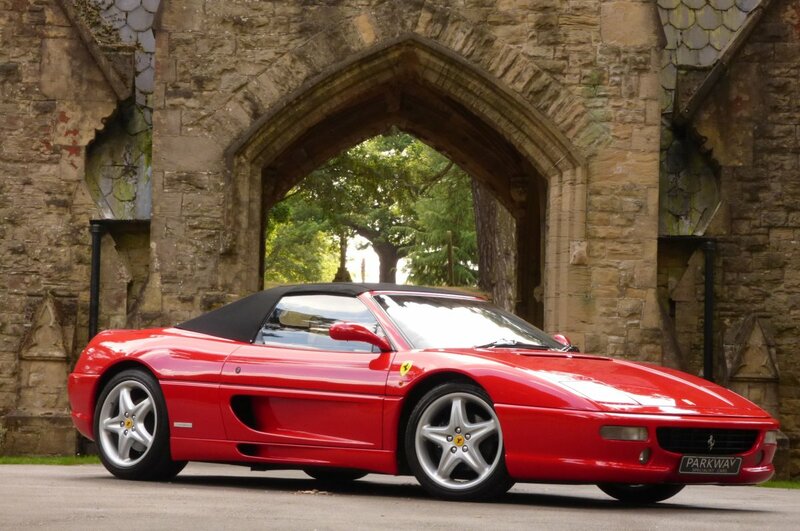 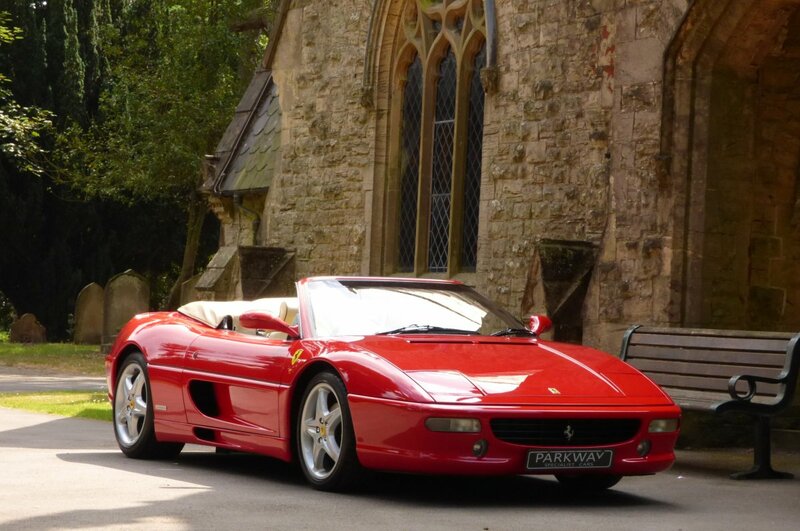 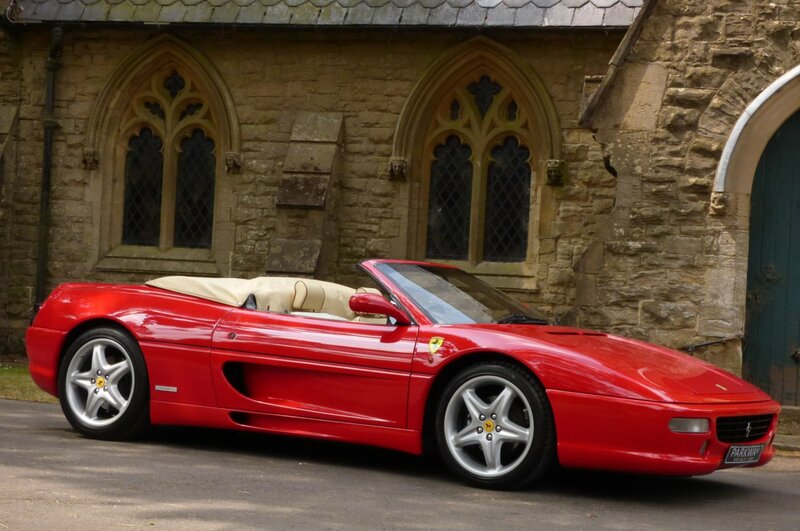 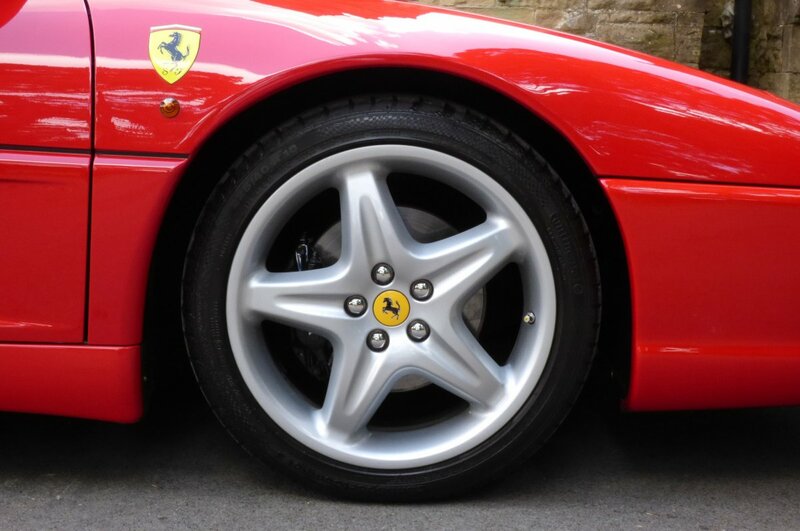 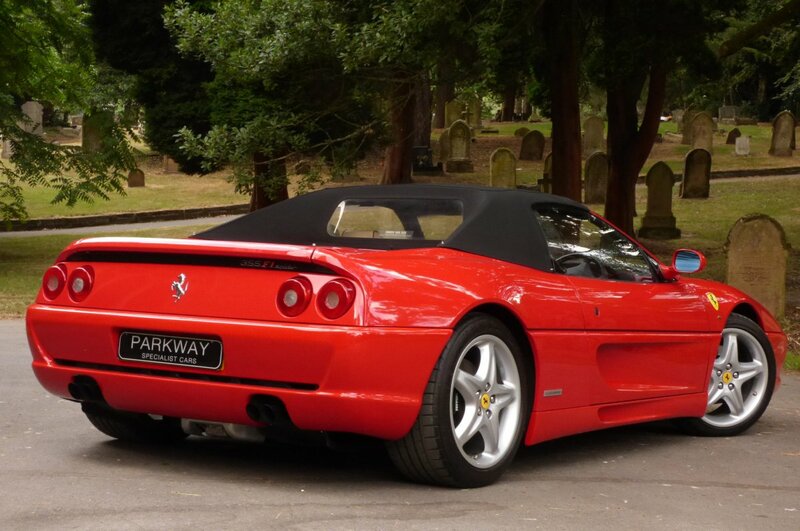 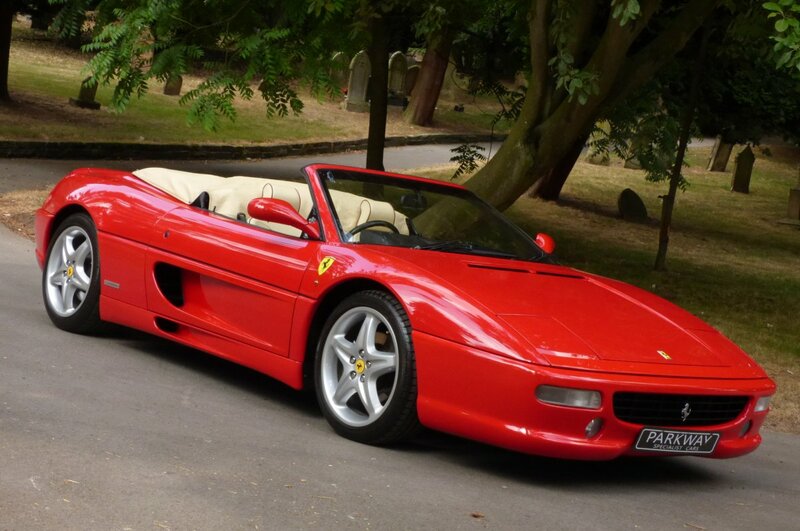 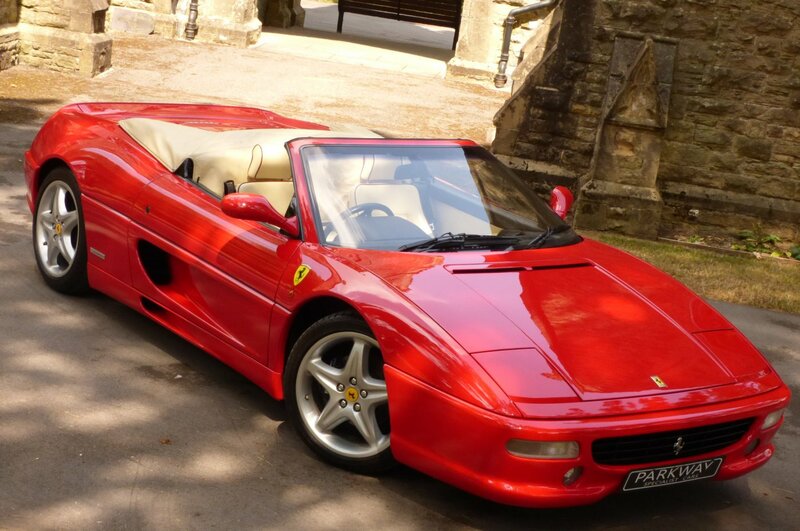 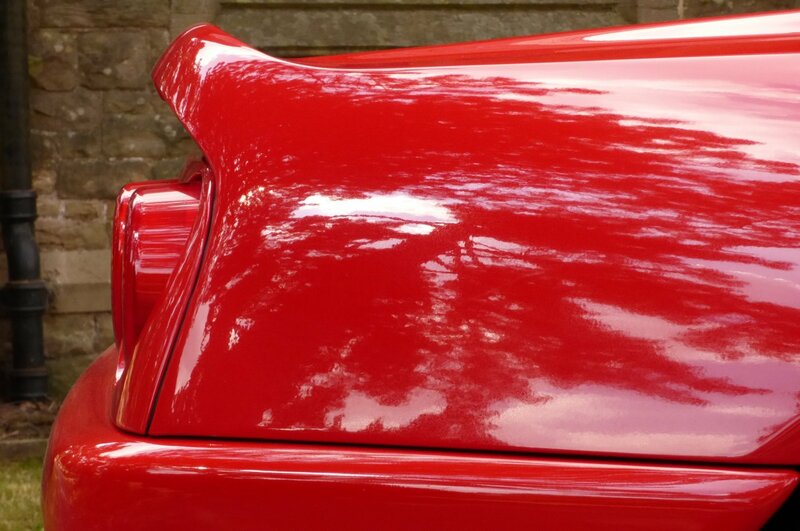 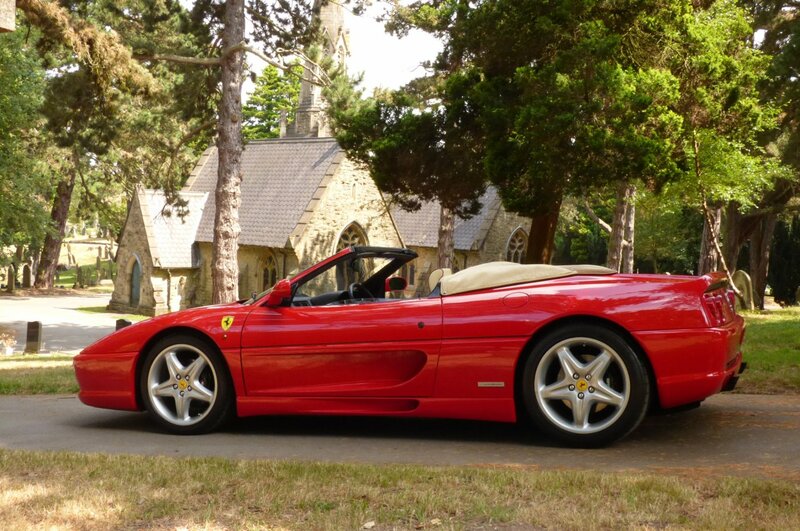 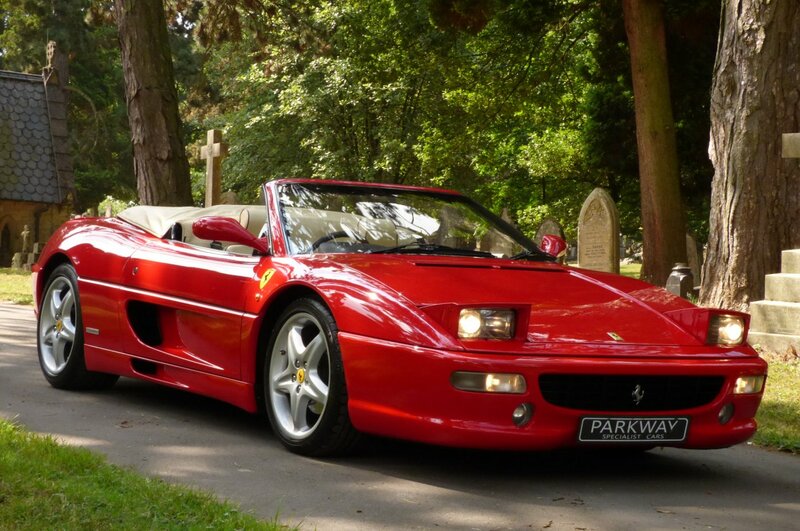 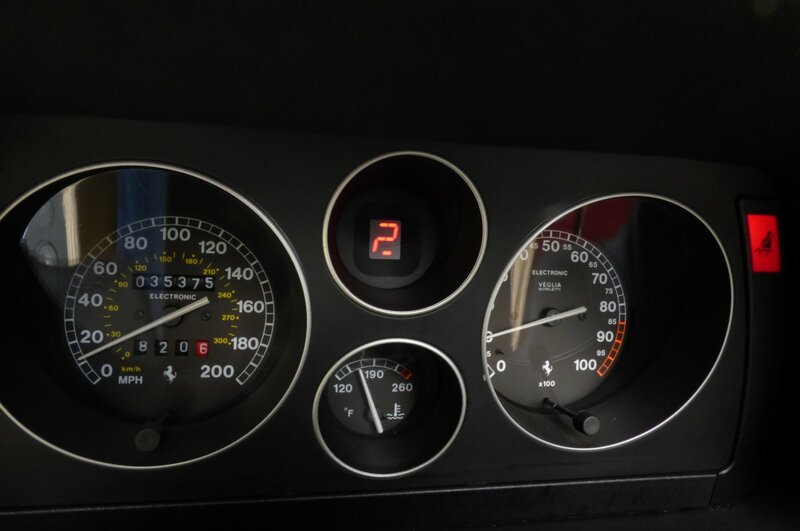 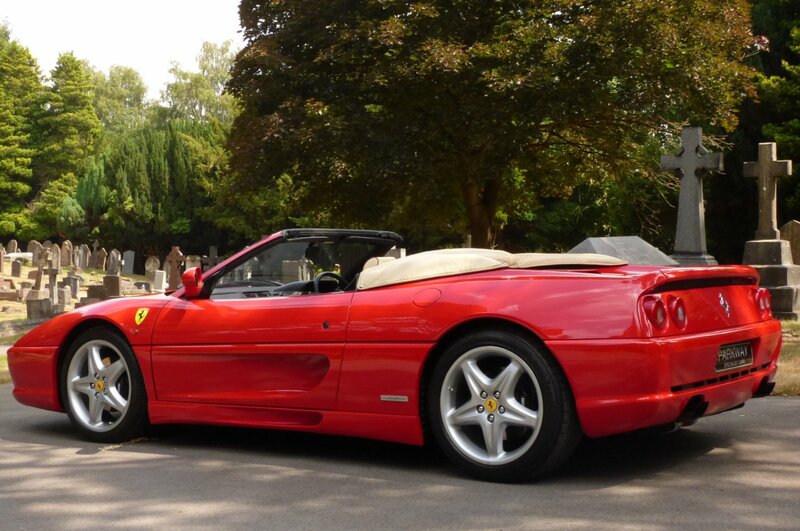 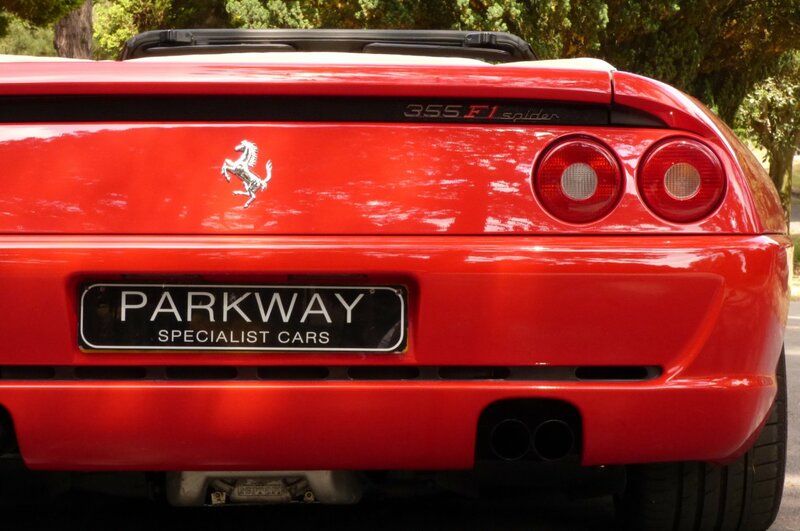 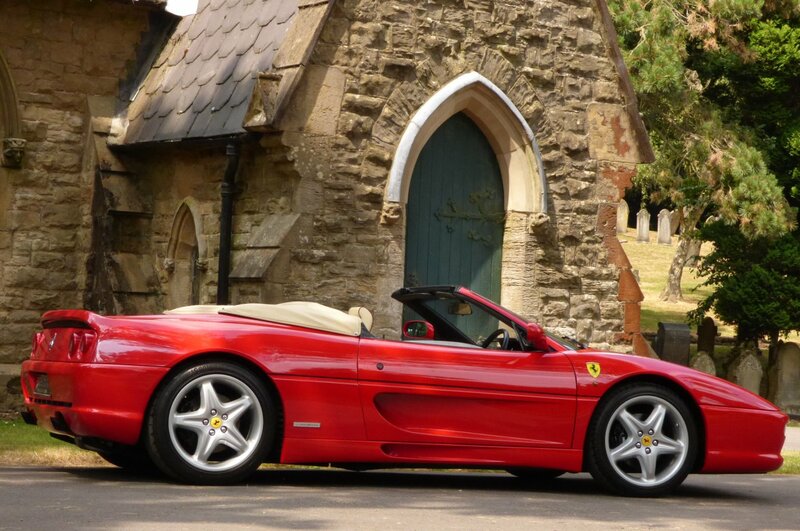 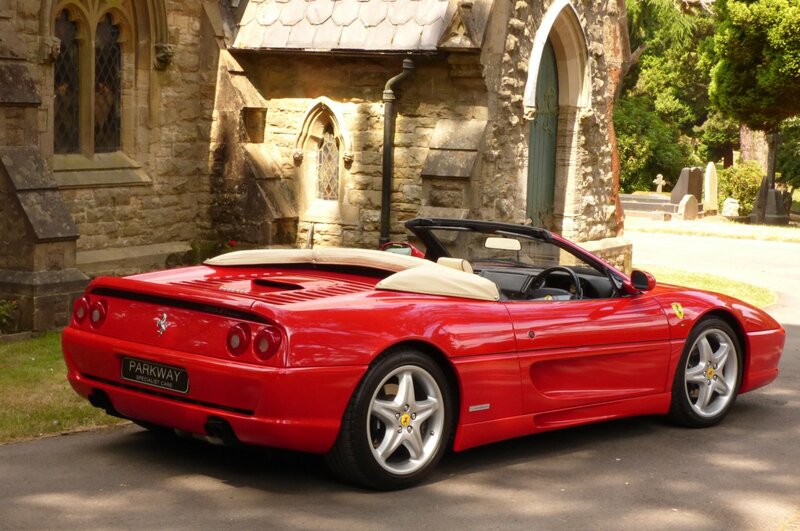 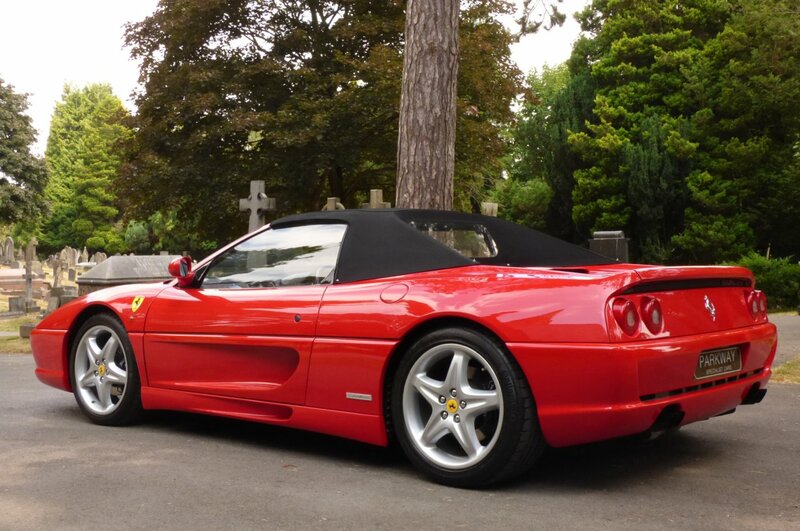 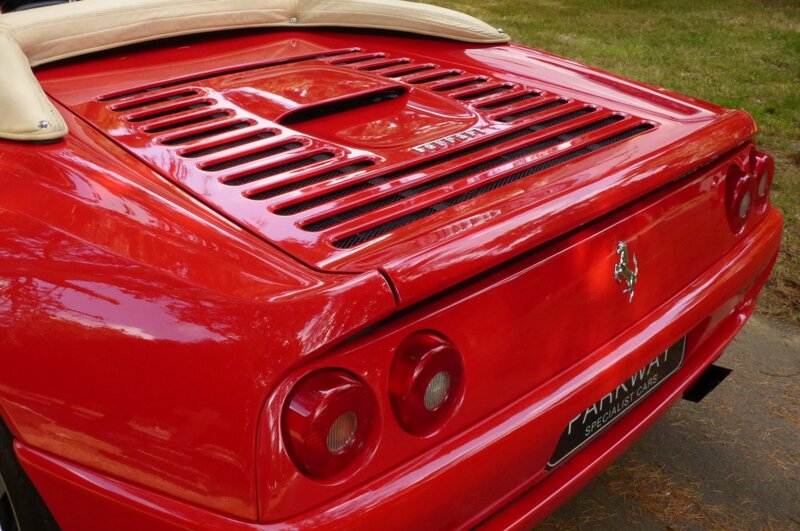 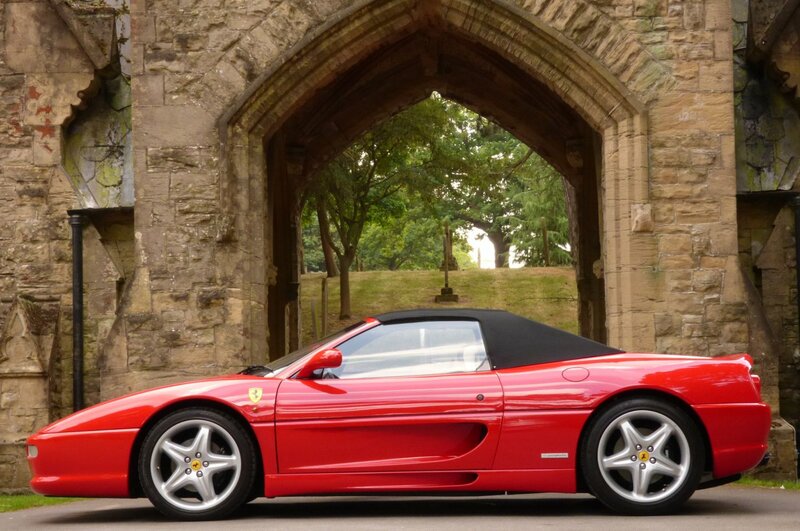 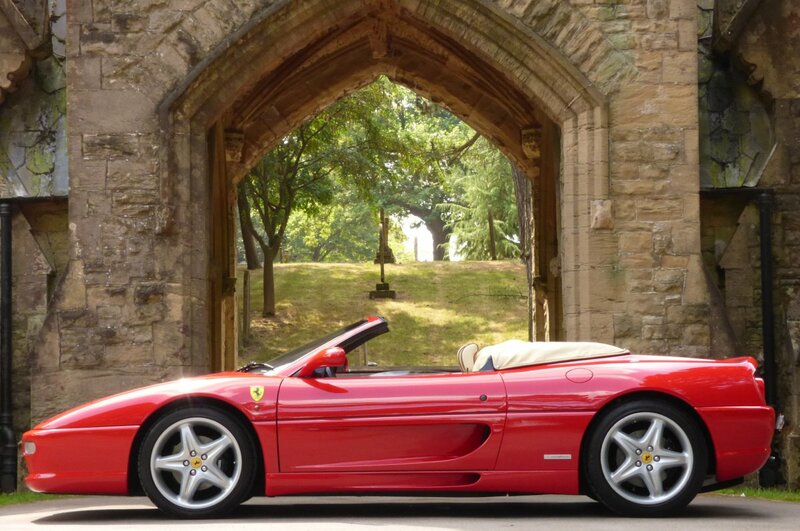 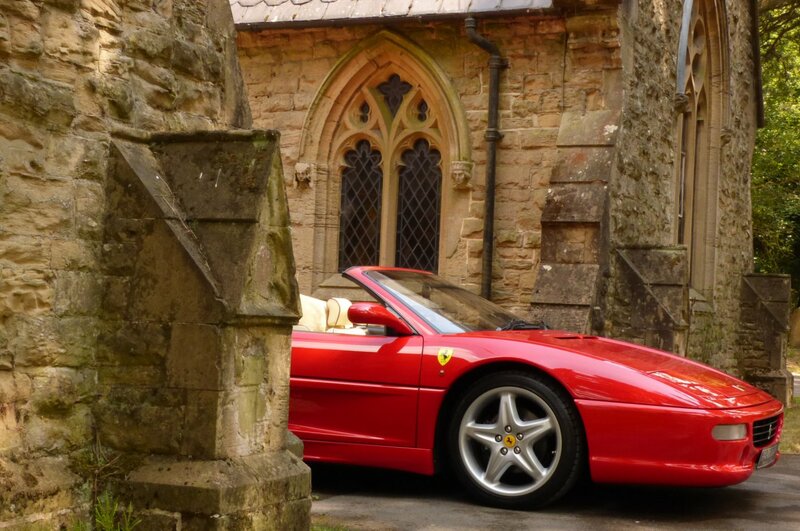 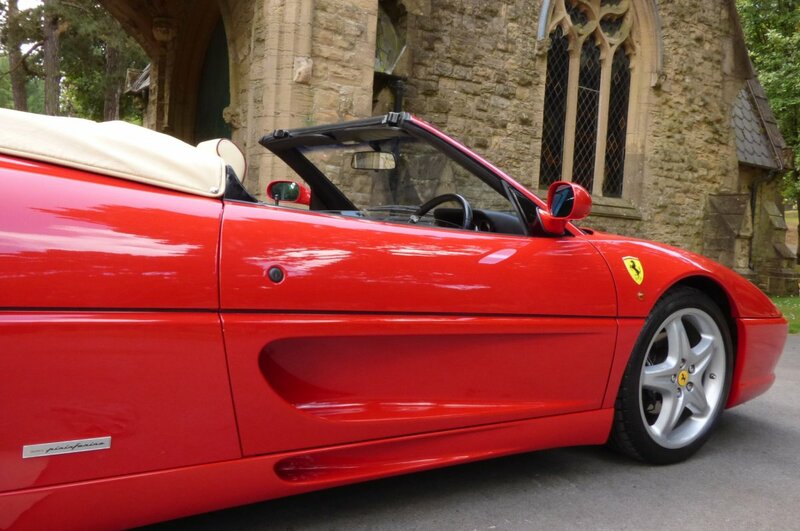 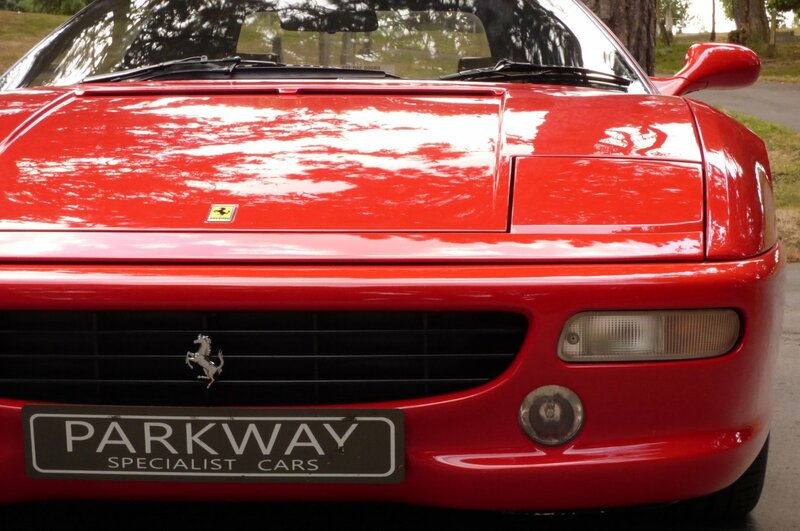 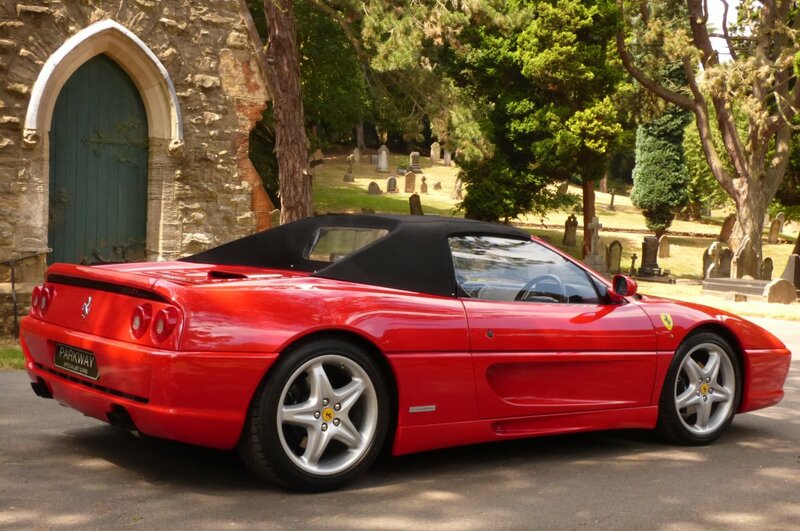 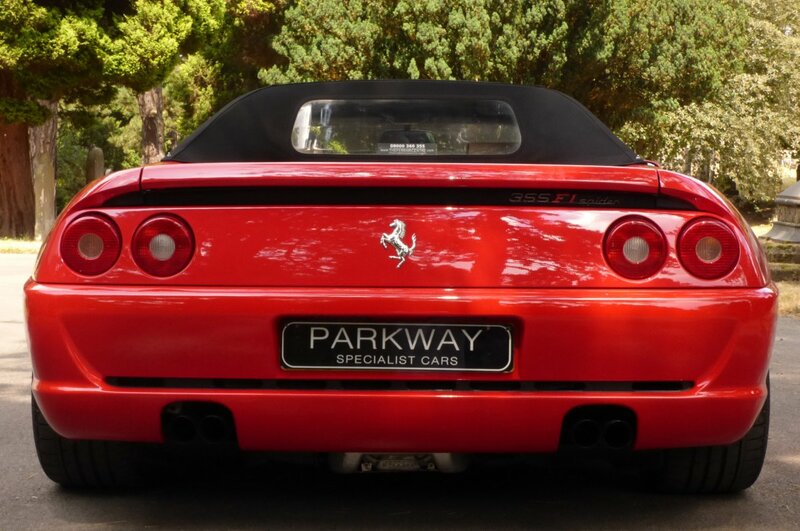 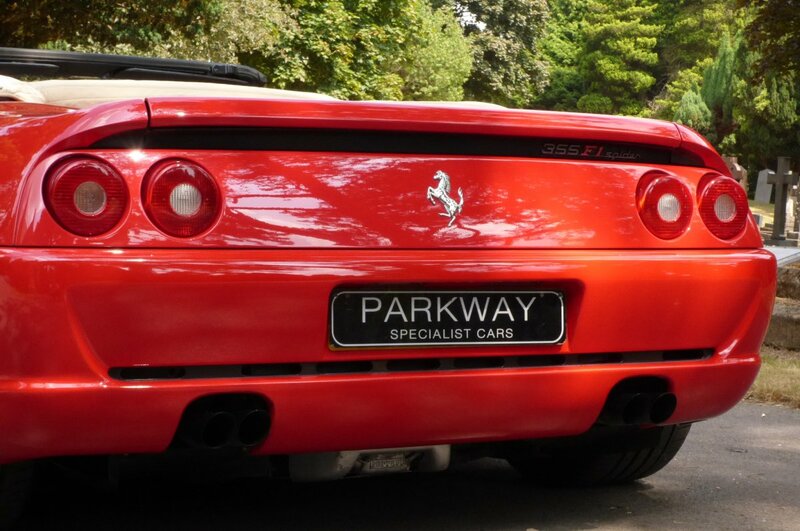 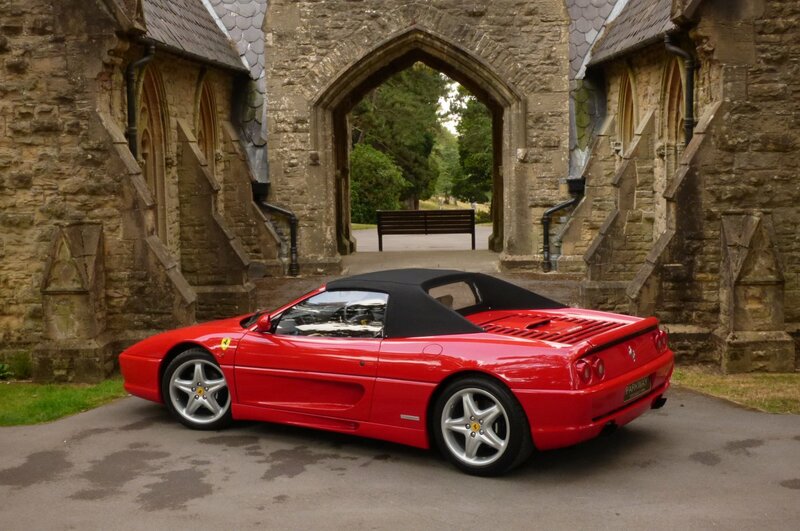 However Regardless Of This Current Sensational Mileage Reading This Ferrari 355 Spider Has Been Maintained To An Exacting Standard With Historical Visits Logged With Ferrari & Ferrari Specialist Service Centres Completed At 5665, 10037, 12383, 15597, 16427, 20185, 21731, 22927, 23631, 23956, 24080, 28241, 34496 & 34751, 34962, 35067 Miles, With The Very Last Visit Carried Out By The Ferrari Centre Who Had Been Instructed To Complete A Full Service, With A New Clutch Replacement And Cam Belt Change. 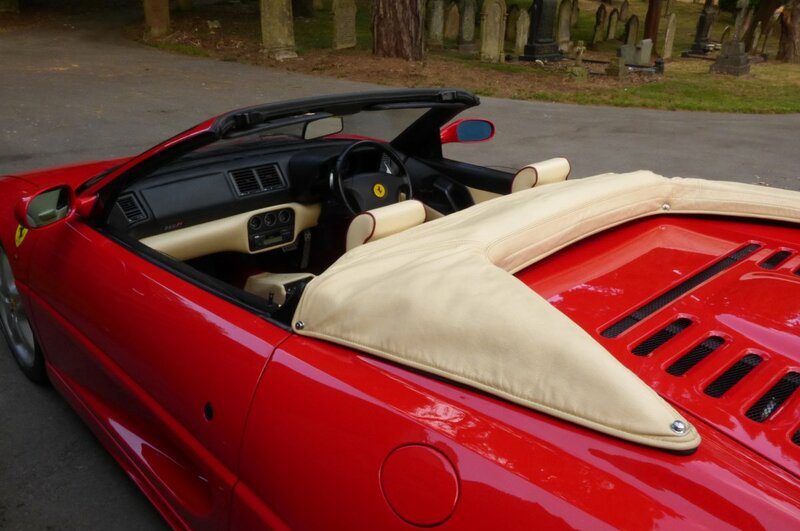 Once Sold We Will Be Delighted To Offer This Classic Looking Ferrari With The Entire Booklet Pack Set & Tool Kit Housed In The Original Tanned Leather Bound Cases, A Fully Cleared Hpi Certificate, A Fully Functional Key Set And An Extensive Past History File Which Contains An Excellent Array Of Historical Invoices With Past MOT Sheets, That Will Further Strengthen The Cars History Trace. 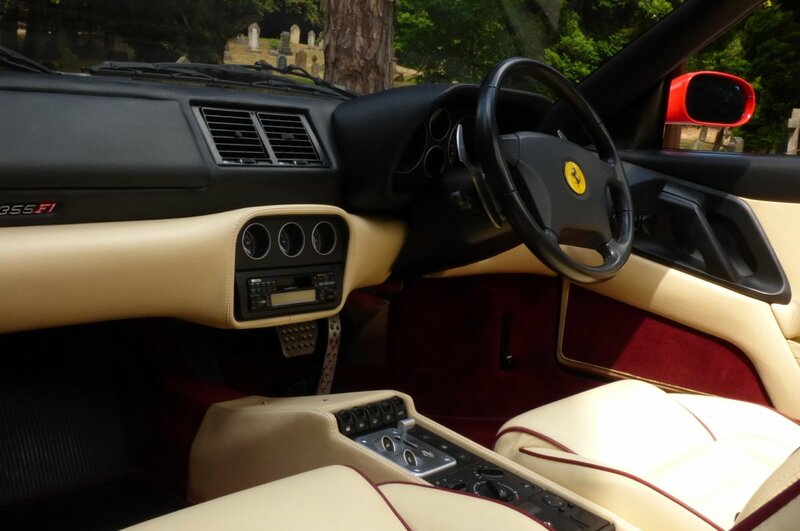 The Interior Of Any Ferrari Offers The Driver And Passenger Pure Theatre, With The Italians Focusing Not Only On Exquisite Detail And Exciting Flair, But Also Giving Maximum Comfort For Any Driving Pleasure, No Matter The Distance Of The Journey. 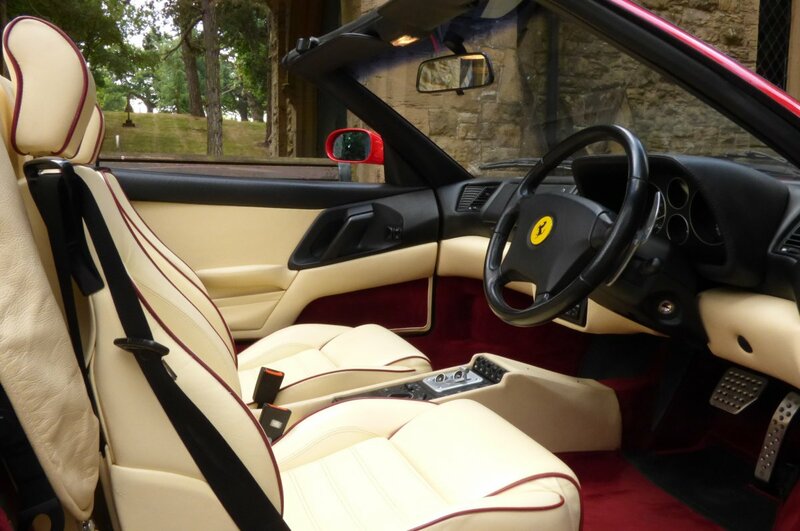 From Factory Build Our Example Was Opted With The Desirable Ivory Crema Leather Sport Seats Beautiful Complemented With Rosso Red Leather Piping, The Bordeaux Red Carpets That Have Been Protected With Ferrari Over Mats, The Two Tone Nero Black & Crema Leather Trimmed Door Cards, The Ivory Leather Bound Hand Brake Lever, The Black Fabric Roof Lining, The Black Leather Trimmed Four Spoke Steering Wheel With The Metal Turned Paddle Shifts, The Two Tone Nero & Ivory F1 355 Embossed Leather Dash That Wraps Around This Inviting Interior, The Metal Turned Ferrari Pedals, The Centre Display Offering Three Information Pods And Decorated With The Ferrari Embossed Carbon Fibre Interior Door Sill Covers, That Finalise This Highly Attractive Environment. 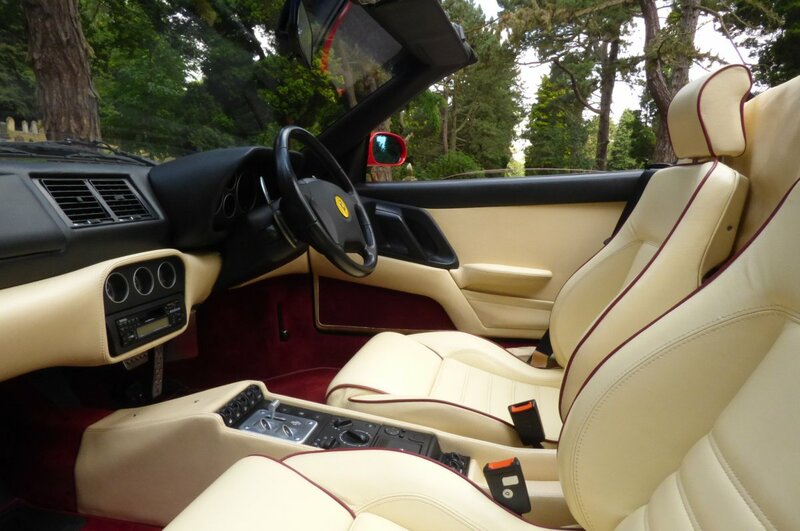 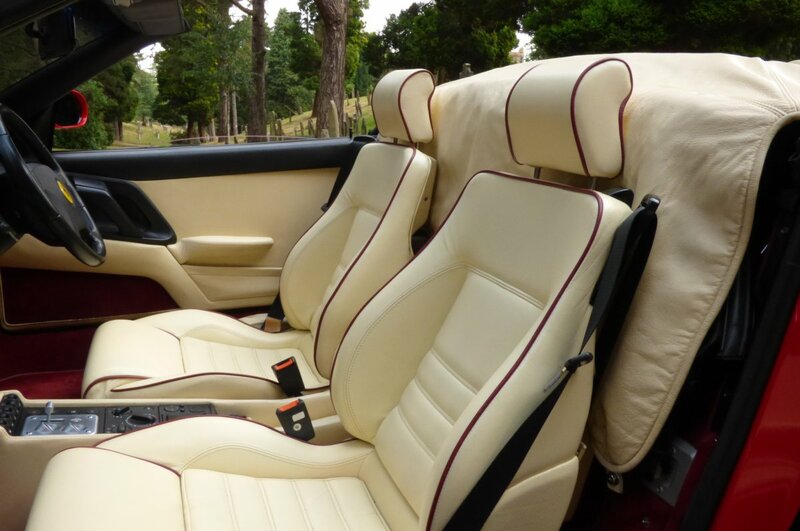 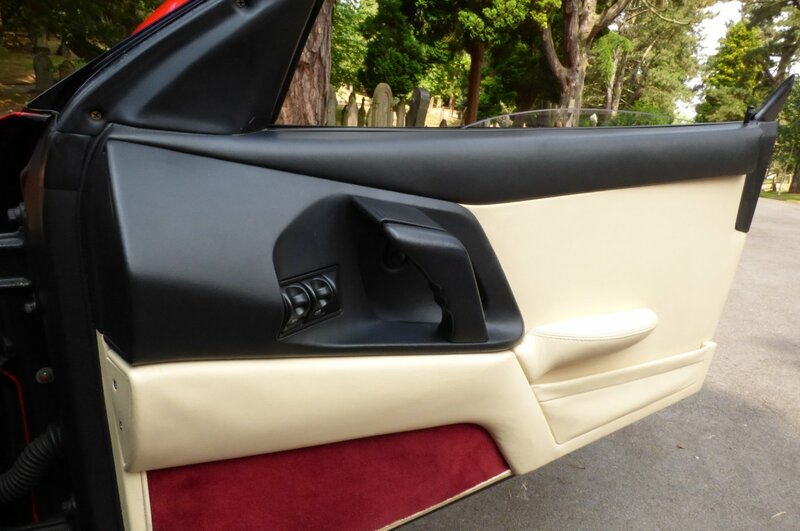 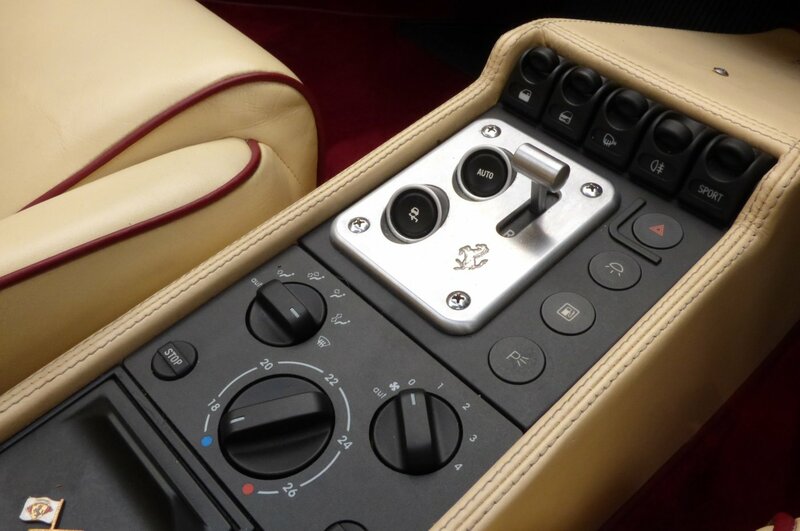 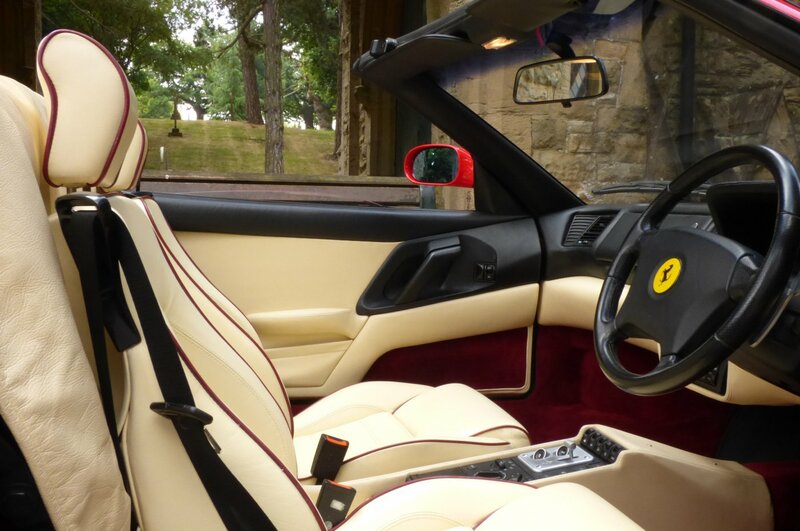 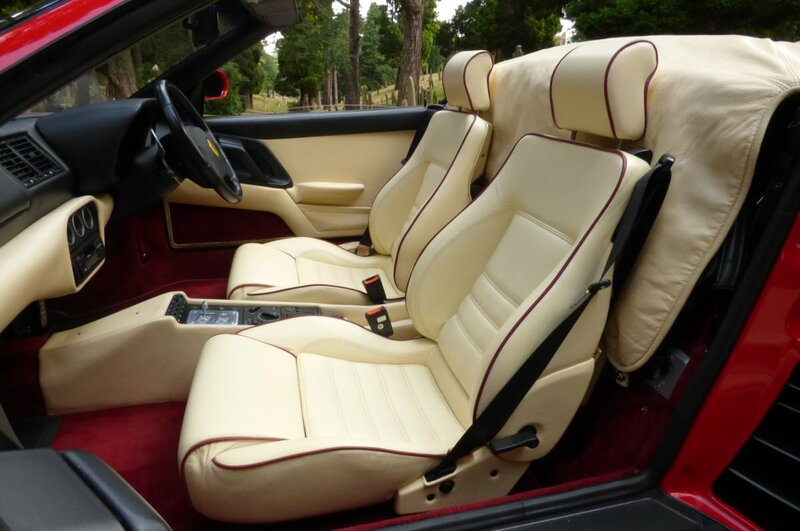 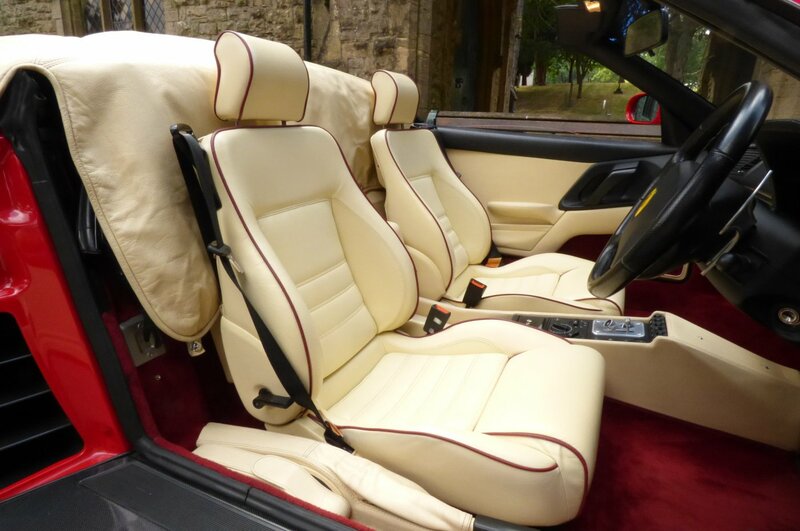 Presented In This Classic Colour Configuration, Our Ferrari 355 Spider Perfectly Creates An Elegant And Sophisticated Feel To The Interior, Thus Making A Cabin That Offers So Very Much On Interesting Design And Luxurious Refinement. 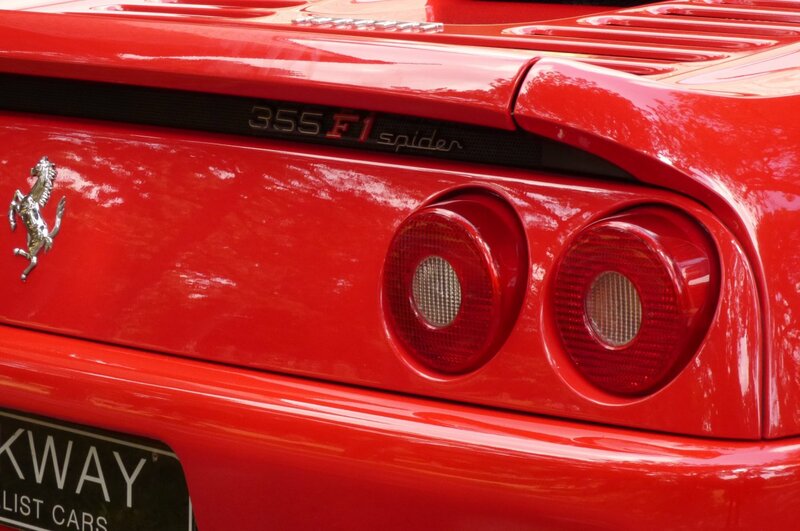 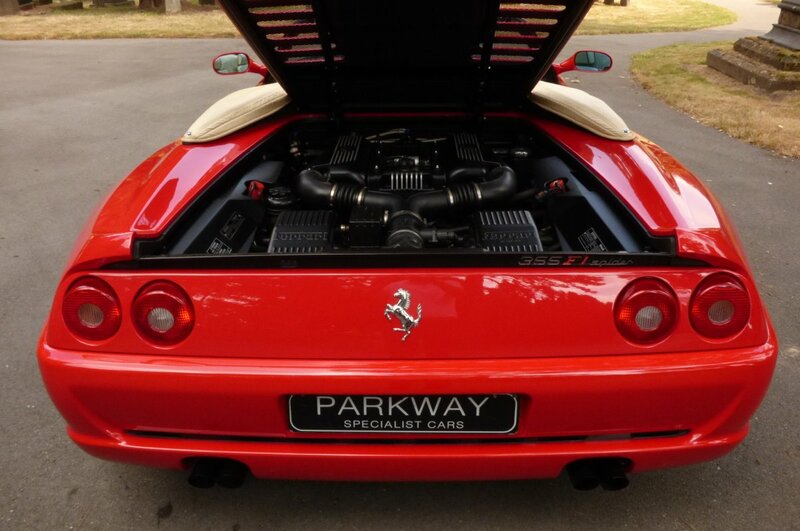 The Sculptured Body Of The F355 Is The Result Of Many Consuming Hours Of Development In The Factory's Wind Tunnel, With The Designers From Pininfarina & Ferrari Concentrating On Aerodynamic Genius, Resulting In The Perfect Collaboration On Dramatic Performance And Elegant Styling, Which Still After Twenty Years Looks Staggeringly Beautiful From Every Given Angle. 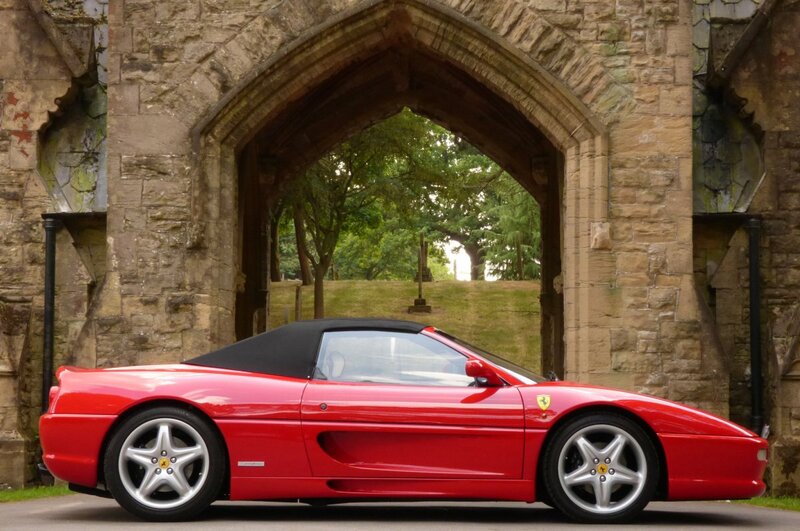 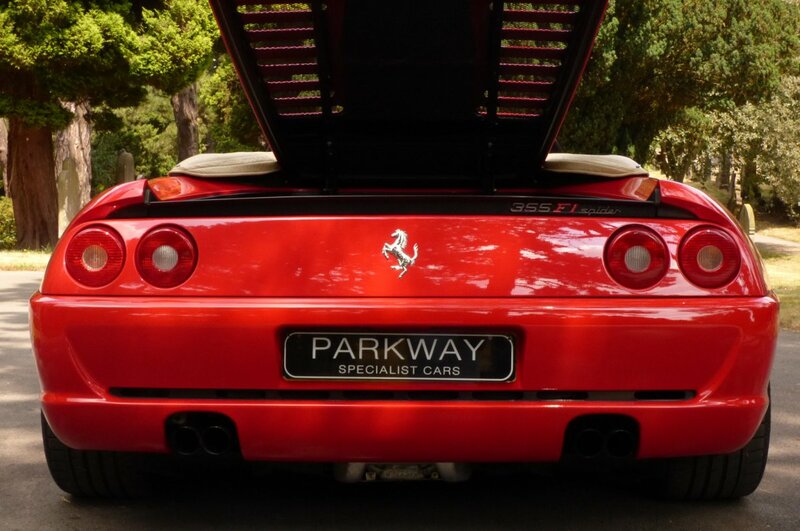 Presented In The Iconic Rosso Corsa Red Paint Finish, This Colour Truly Demonstrates The Sublime Ferrari Exterior Curves, The Powerful 355 Lines And Looks Sensational With Or Without The Black Canvas Roof In Place. 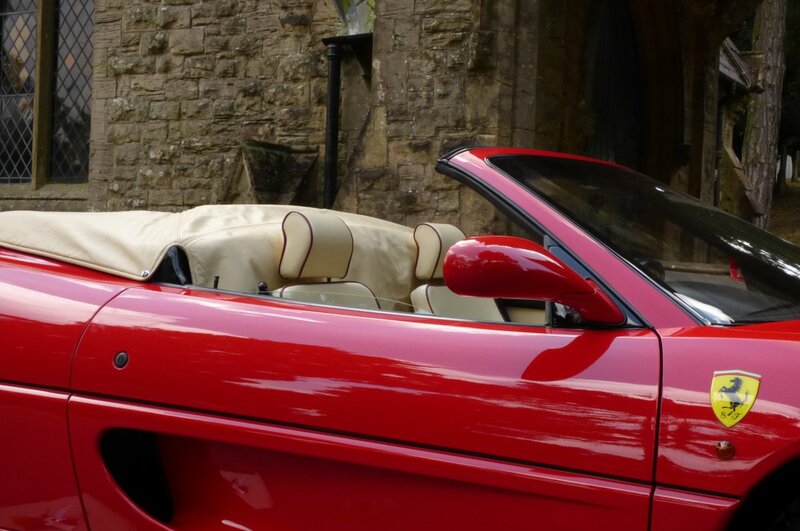 Further Exterior Detailing Is Presented With The Unmarked Silver Finished 16" Five Arm Speedline Alloy Wheels Wrapped Around Branded Tyres, Multiple Black Mesh Grilles Over The Engine Lid, The Blackened Horizontal Front Grille Decorated With The Chromed Prancing Horse, The Side Engine Air Vents Which Are Seamlessly Crafted Into The Lower Door Sections, The Blackened Tipped Quad Exhaust Pipes, The Black Canvas Electric Convertible Roof Which Changes The Cars Appearance With A Touch Of A Button, The F1 355 Motif That Decorates The Rear, The Scuderia Front Wing Badges, Ferrari Embossed Black Brake Calipers And Presented With The Now World Famous Ferrari Pop Up Front Lights, Which Perfectly Finalises This Beautiful Vehicle Stance. 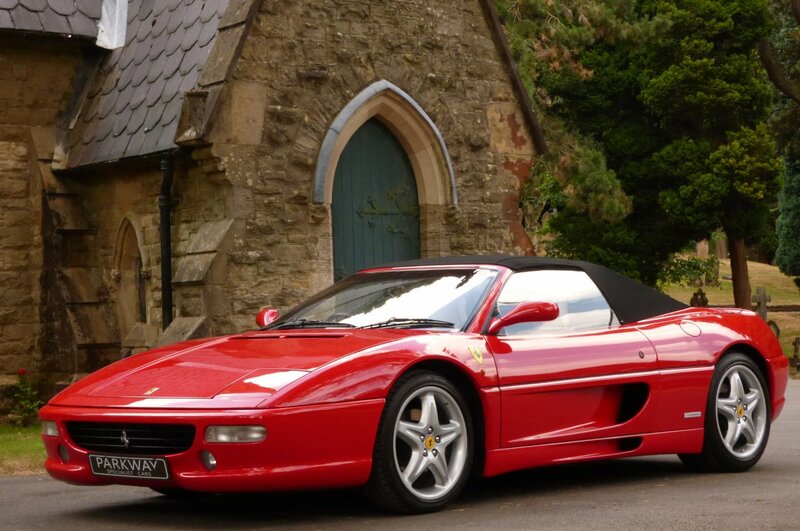 This Has To Be One Of The Best Looking Cars To Come From The Maranello Factory And Would Be Perfectly Positioned Outside A London Town House Or As The Ideal Vehicle To Blow Away Those Sunday Morning Blues. 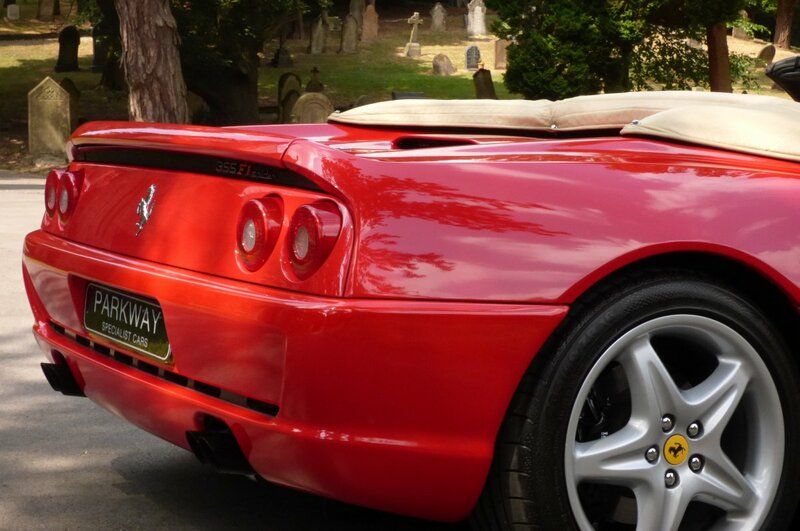  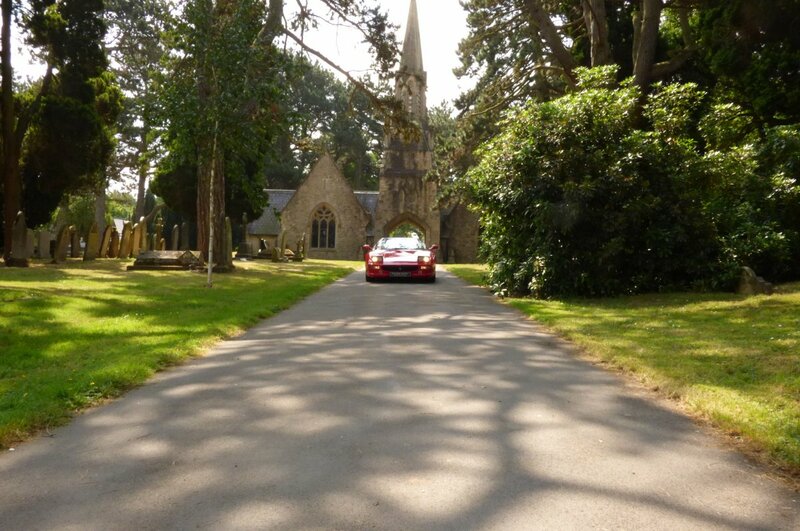 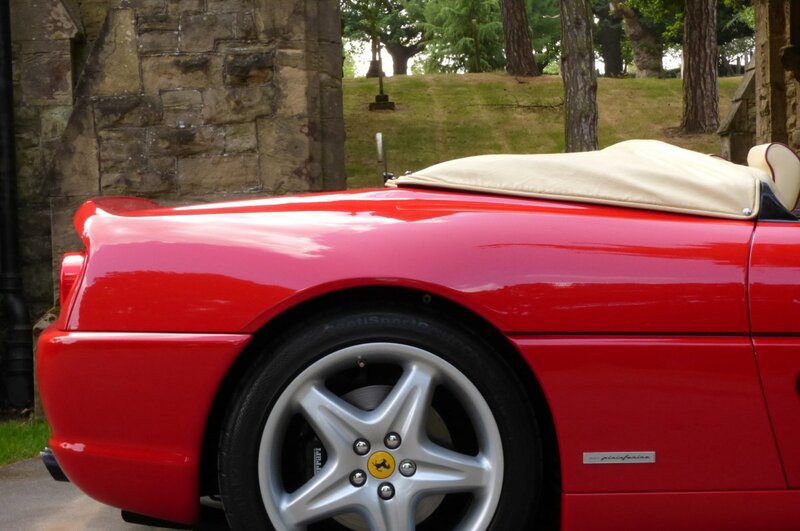 We Are Delighted To Have Available This Lovely Ferrari F1 355 Spider Become Available On Our Current Vehicle Inventory. 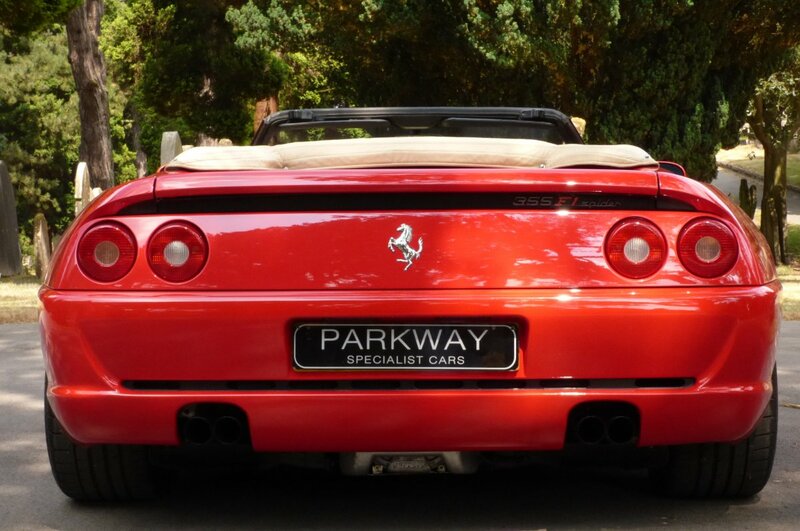 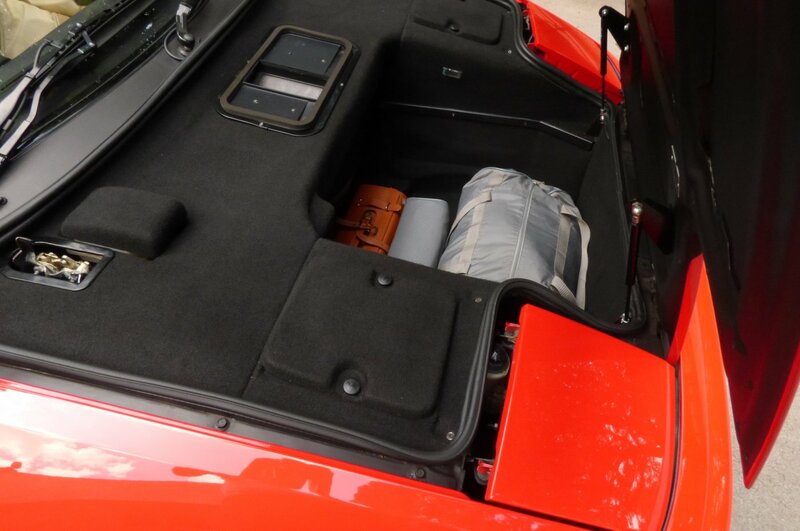 The Car As Specified From Factory Includes Options Of The Unmarked Silver Finished 16" Five Arm Speedline Alloy Wheels, The Black Canvas Electric Convertible Roof With Ivory Leather Trimmed Cover, Ferrari Embossed Black Brake Calipers, Metal Turned Ferrari Pedals, Ferrari Embossed Carbon Fibre Internal Sill Cover Plates, Sport Function, Electric Windows & Mirrors, Electric Front Seat Adjust, Blackened Quad Exhaust Tips, Giallo Yellow Front Wing Scuderia Shields, Remote Central Locking With Alarm, Radio System With Cassette, Front Driving Lamps And So Much More. 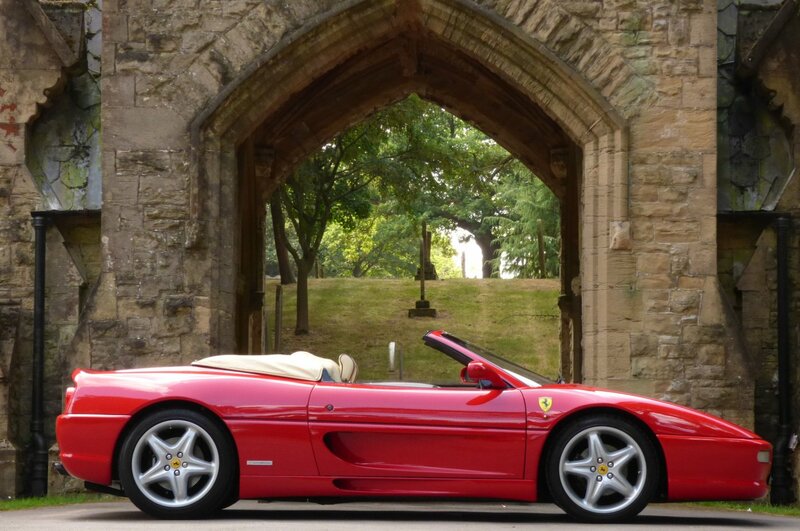 A Remarkable Example Presented For Sale With The Entire Booklet Pack Set, A Fully Cleared Hpi Report, A Fully Functional Key Set And A Complete Tool Kit, All In Place For That Next Keeper.